Socks are made from several counts of Certified Organic Long-Staple Cotton yarn from the U.S. and Peru. They also contain specially made cotton-covered Lycra and Natural Rubber. The Lycra and Rubber are used to aid stretch and durability and to ensure a good fit for a wide variety of feet. All of Maggie's dyed products are made with the least amount of environmental impact possible, while still assuring color fastness and vibrancy. 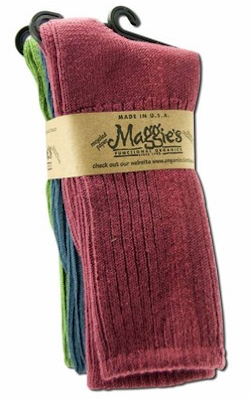 Initially Maggie's colors were all created with "natural" dyes.